This certificate is framed in our classic, wood frame which is 1 1/4" wide with an overall size of 18 1/4" x 20 1/4". Double matting, archival mounting, acid free backing and clear glass are used in framing this certificate. The price includes the classic gold frame, heavy duty packaging and USPS priority shipping allowance of $25 in the continental U.S.
Mailing to Alaska, Hawaii, and international destinations is available at actual cost. 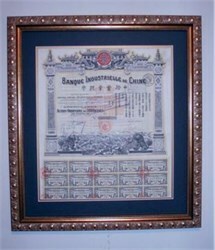 Beautifully printed certificate from the Banque Industrielle de Chine - China Industrial Bank issued in 1913. This historic document was printed by Charles Skipper and East and has an ornate border around it with a vignette of Chinese dragons and pagodas on top flanking the Company's logo and a vignette depicting the City of Shanghai at the bottom. Underprint of Forbidden City building at center. The Banque Industrielle de Chine (Industrial Bank of China) was established under the laws of France in 1913. It conducted a general banking business with a strong interest in financing transactions with China. The company had branches in China, Siberia, Japan, Indo-China, Straits Settlements, United States, England, France and Belgium. Banque Industrielle de Chine closed down in 1921 after declaring bankruptcy. The company got a second life under Chairman Mao in 1949 as it became the first foreign bank allowed to do business in the People's Republic of China.